At City Orthodontics, we pride ourselves on keeping up-to-date with the latest in technological advances in the orthodontic field. It’s our goal to make sure that we’re always capable of supplying you with the perfect orthodontic treatment to fit your every need. We’re proud to offer a comprehensive selection of orthodontic treatments in our Toronto office, from Invisalign to traditional metal braces. While Invisalign may be only recommended for adults, we now offer a new treatment that’s suited just for teenagers – Invisalign Teen. Invisalign is the alternative to braces; instead of using the metal wires and brackets of braces, Invisalign shifts a patient’s teeth through the usage of plastic aligners. A series of removable aligner sets are crafted using advanced 3-D computer technology. You’ll wear the first set of aligners for a two-week period and then move onto the next designated set for another two-week period. After you’ve gone through all of the aligner sets, you’ll find that you’ll have your straight and healthy smile, just the way the orthodontist prescribed. Previously, Invisalign wasn’t recommended for teenagers and younger patients because of two different problems. The first problem is that younger patients still have their teeth growing in. Teeth that erupt during this time can cause the orthodontic treatment to be disrupted. The second area of concern is with the usage of the aligners. Because the aligners are removable, there was a worry that many teenagers wouldn’t actually keep their aligners in long enough for them to work the way they were prescribed. Thankfully, Invisalign Teen is here to solve both of those problems. With the usage of ‘eruption tabs,’ Invisalign Teen will be able to keep space open for teeth that haven’t erupted yet. Invisalign Teen also comes with ‘compliance indicators,’ which are small dots on the back of the aligners. If the patient is wearing the aligners as often as they’re prescribed, then the indicators will fade away. 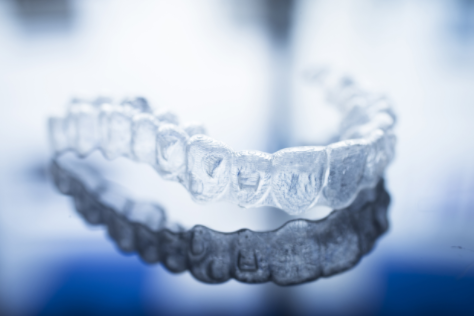 If the indicators don’t fade away, that’s a signal that the aligners aren’t being worn enough. Invisalign Teen aligners are clear, allowing you to have a virtually discreet orthodontic treatment. Because the aligners are removable, you’ll be able to take them out for eating, teeth cleaning, and any important occasions. Since you’ll take out the aligners prior to eating, you don’t have to worry about changing your diet or avoiding foods during treatment. The aligners are made out of polyurethane plastic, granting your mouth more comfort than with the metal wires and brackets of braces. Unlike with braces, where you’ll have to schedule extra appointments for loose or broken wires and brackets, the aligners are sturdy and likely won’t require any additional maintenance. If you have any further questions about our Toronto Invisalign and Invisalign Teen treatments, please feel free to contact us. If you happen to be interested in Invisalign, Invisalign Teen, or any of our other orthodontic treatments, we encourage you to give us a call at (416) 222-3223. We hope to hear from you soon!